Earth Sign is described as a combination of burgundy brown, teal and neon red matte glitters accented with chartreuse metallic—all in a shifty teal-to-burgundy base. I layered 1 coat of Earth Sign over 2 coats of Pure Ice French Kiss and top coat of Seche Vite. 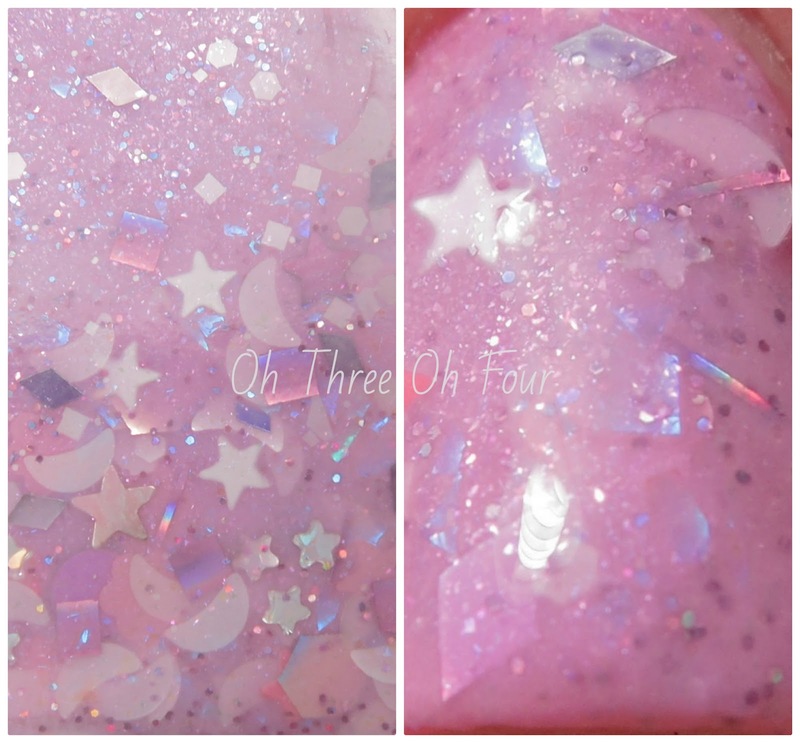 Pink Moon is assorted moons and stars accented with rainbow dust in a translucent pink-shimmered lavender-pink base. Except for my middle nail, all nails are 2 coats of Revlon Victorian with 2 coats of Pink Moon. My middle nails uses Victorian as a base color but has 3 coats of Pink Moon on top. Summer of Love 2013 contains a mixture of neons, holographics and brights in a purple-tinted transparent base with blue shimmer. My first set of photos I started with 2 coats over Pure Ice Belle of the Ball and added 2 coats of Summer of Love 2013. I couldn't make up my mind which base colors I liked more, so I included them both. ;) The purple neon glitters got somewhat lost over Pure Ice Belle of the Ball, though the shimmer really popped! For this manicure I layered 2 coats of Summer of Love 2013 over 2 coats of NYC Water Street Blue and 2 coats of Pure Ice Starry Night on my pinky nail. Purchase Lynnderella polishes through Lynnderella.com or if you are within Europe through Norway Nails. Be sure to follow all the Lynnderella fan pages on Facebook, Twitter, Instagram, Pinterest and Tumblr!